Over the last few years, an increasing number of people around the world have become obsessed with Nordic cooking. Nordic cuisine is linked with each country’s landscape and the availability of ingredients dependant on the season. In the summer months, Nordic landscapes are characterised by nearly 24-hours of sunlight a day – bathing forest floors with dew-soaked berries in myriad colours and varieties. However, these heady days of endless sunlight are finite, and during the long, cold winter months, natural foods of all varieties are scarce. Thanks to the abundance of untouched land in the Nordic regions, and an appreciation for “alsemstraat” (i.e., freedom to roam), foragers from the fjords of Norway to Finland’s forests can scour the landscape for ripened nordic berries. Generations of Norden families enjoy gathering berries as a solitary or family pastime. They also pass down their family methods for preserving these precious gifts and incorporating them into their winter meals. Read on to let us introduce you to the wonderful world of Nordic berries and how you can adopt these superfoods into your diet all year-round. Known as ‘mountain gold’ or ‘highland gold,’ these orange-coloured berries are some of the most expensive and highly sought-after berries in the Nords, due to their elusive nature and delicious flavour. Harvest season only lasts for few weeks between August to September, and some years, the berries may not even appear at all. Despite our best efforts, cloudberries cannot be grown commercially and can only be found – and handpicked – in mountainous and waterlogged regions – from Sweden across the Baltic countries, up to the Arctic Circle. The cloudberry plant is a hardy one: their roots can form up to 30 cm below the ground’s surface, and they’re strong enough to withstand sub-zero temperatures of up to -40°C. Cloudberries are a rich source of vitamins A, C and E – in ancient times, Norwegian sailors ate cloudberries to prevent the onset of scurvy. Nowadays, cloudberries are often sold in preserves, and the leaves can be used in winter teas (check out Inuit Tea for a range of winter brews). They’re also popular in Nordic desserts; In Norway, cloudberries are mixed with whipped cream and sugar to create multekrem (‘cloudberry cream’). In Sweden, cloudberry ice cream (aka hjortronglass) is also a favourite pud. Check out this recipe for more inspiration. Sea buckthorn berries are a national treasure in Denmark in particular. These little berries are orange in colour and pack a punch – they hold a sour tang, with a flavour not unlike mango or pineapple. These days, many a hipster Nordic berry enthusiast loves a sea buckthorn berry and honey booster drink, but sea buckthorn berries were a superfood long before the term ‘superfood’ was even invented. For thousands of years, Nordic populations have been using sea buckthorn berries to boost their immune systems and treat illnesses. Filled with vital antioxidants, this fruit is also a powerful source of omega 3, 6 and 9, and is great for the immune system in winter. The oil from the seed of buckthorn berries can also be extracted and used as a treatment for some cardiovascular conditions. Lingonberries are a staple in all Nordic cuisines, and are widely used in a variety of different dishes. They grow from late July to September and prefer to grow in shady locales, such as on the edges of forests. Traditionally, lingonberries were collected in the summertime, crushed up with sugar and preserved at room temperature for an accompaniment to winter red meat. In most cases, lingonberries are too tart to be eaten without sugar – this makes them the ideal berry for use in jams and sauces. You may recognise the humble lingonberry from that classic Swedish dish in the IKEA canteen – meatballs, mash, lingonberries and gravy. It’s a simple but tasty dish that is widely eaten across the Nordic countries with some variations (the Danes like adding red cabbage and pickled beetroot for example, while Norwegians love their creamed cabbage on the side). Lingonberries are also an excellent source of B vitamins, potassium and phosphorus. Both berries and leaves can also be used as a herbal remedy to treat urinary tract infections, or act as a diuretic. And for dessert, trollkrem (lingonberry mousse) is easy to make and a family-favourite in countries like Norway. Wild Nordic strawberries are tiny in comparison to your average British garden variety – their smaller size makes them packed with flavour, and they taste incredible fresh or with a dash of cream. 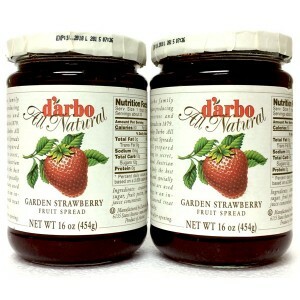 Wild strawberries – which only grown from early June to July – also feature in many jams (Darbo Wild Strawberry Jam is a famous brand in Norway). If you have the patience, cook wild strawberries on low heat for many hours to make this wild strawberry tapioca recipe. Nordic blueberries are smaller and darker in shade compared to the supermarket blueberries we recognise in the UK. They grow from mid-July until August and can be tart in flavour, but taste great freshly picked. Blueberry bushes can be found low to the ground on forest floors across Scandinavia, and many Nordic locals like to pick wild blueberries and freeze them for the winter. They’re commonly found as an additive to alcoholic and non-alcoholic drinks, but are also eaten for breakfast with milk or skyr (Icelandic yoghurt) to start the day healthily. We particularly like the look of this Finnish blueberry and yogurt pie (Mustikkapiirakka) recipe. Noma restaurants are Scandinavian pioneers of gastronomy. They take the practice away from high-quality luxury ingredients and turn their attention instead to everyday products available to everyone, such as some of berries we’ve mentioned in this post. Noma are most noted for introducing elaborate masterpiece dishes – one even designed to look like a forest floor on a summer morning! Noma’s founder, Claus Meyer, has stated that he wants to change people’s perceptions of locally sourced produce. He wants others to see it as a highly desirable way to eat – similar to the paleo diet. If you find yourself in Copenhagen, look out for one of various Noma-esque eateries – such as Relae – making the most of the fat of the land in their delightfully quirky and wholesome dishes. Claus Meyer is also a brand in Scandinavia in his own right. In Meyer’s campaign to change the way the world thinks about locally sourced food, he penned the hugely successful, The New Nordic Kitchen Manifesto. Food bloggers and social media influencers across Scandinavia have taken the New Nordic Kitchen Manifesto to heart, sharing recipes with their millions of fans. Helles Kitchen, for instance, is written by Norwegian food blogger, Helle Valebrokk. Here, she shares tons of traditional Nordic recipes, as well as reviews and delectable food and drinks recipes. Gastromand is a network of four male bloggers that share all of their best recipes and tips – by men and for men – across Denmark. And finally, Karla’s Nordic Kitchen is an excellent source of easy-to-follow Scandi recipes, courtesy of Karla – a young food blogger from Copenhagen. Her blog is packed with mouthwatering ideas, this Raspberry Breakfast Trifle being just one of them. To bring the delights of nordic berries to your kitchen table, check out scandikitchen.co.uk and get them delivered frozen to your door. Alternatively, you can find berry-flavoured jams from retailers like Waitrose, or even the food hall in your nearest IKEA store.